Awarded ASTRA BEST TOY for 2013. 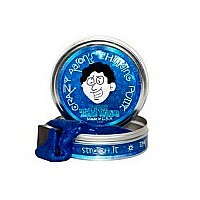 Crazy Aaron's Puttyworld is the maker of the world's only true magnetic Thinking Putty. Our brand new Tidal Wave is a deep iridescent blue and comes with a large ceramic magnet that is safe for children 8 years and older. It can be used as a toy and a stress reliever and is great for learning and science experiments. The best part--no batteries required! Our new Super Magnetic Thinking Putty is softer and more pliable than our original, making it easier to stretch, squeeze, and shape. The larger magnet makes for a more rapid and stronger magnetic response and is easier to use for magnetic tricks. When Super Magnetic Thinking Putty is stretched, molded, or shaped, the putty has no magnetic charge and behaves like any other Thinking Putty. However, in the presence of a magnetic field, its magnetic forces begin to align. All Made in USA by individuals with intellectual and physical disabilities, each metal tin is hand packed with 1/5 lb of Thinking Putty and a new large ceramic magnet for endless hours of Thinking Putty fun and creativity!